The last thing you expect as a law-abiding citizen is to ever have cause to hire a Criminal Lawyer. But what if you or your teen were caught driving under the influence? Or worse, you drove over someone and are up for manslaughter. I shudder at the thought. What if your husband or teenage son tried to be the hero and rescue someone who was being beaten up and now they are up for assault? It happens. What if you’ve been accused of Tax Evasion or Embezzlement? You just never know when you may need a good criminal attorney at your side. If you or anyone in your family has been arrested and is facing criminal charges, this is one time you won’t want to go it alone. Seek help and seek it fast. A Lawyer has knowledge and grasp of the legal process and they know your legal rights. A good Attorney knows the law inside-out and can give you options you never knew existed. Their knowledge is your protection. Knowing how to follow procedure is vitally important as mistakes can be costly. It seems counter-intuitive that you will save money by hiring a Lawyer, but this is usually true. Criminal Lawyers deal with cases like yours every day. That’s why they are able to take a step back and look at it calmly without emotion clouding their judgement. They are also able to argue your case calmly. They know what to say and what not to say. You don’t, especially if you’re an emotional wreck, which is understandable, considering you never expected to be in this position in the first place and you’re wrought with feelings of humiliation, guilt, confusion and fear. A Criminal Lawyer is in a position to work through all the evidence, interview witnesses and makes sure evidence is valid and admissible in court. There’s no way you or your family can do this if you’ve never done anything like this before. Even if you have some kind of legal background, if you’re a Divorce Lawyer or a Tax Lawyer, you will not be in the right frame of mind when you’re the one facing the mighty arm of the Law. In business, they say it’s not what you know, it’s who you know and this is true in Courts of Law as well. A Criminal Defense Attorney has built relationships over years with Judges, Prosecutors and Expert Witnesses. They may even have Private Investigators working for them who can help them build their case. Along with this magic mix of legal knowledge, experience and connections, a brilliant Criminal Defense Attorney also has the gift of the gab. And a competitive mindset. They know how to present an argument and back down from one. They know the value of a perfectly placed open-ended question. They know when to keep quiet and when to speak up. They are your ally and protector. They want to win your case as much as you do. And that’s why they can work miracles in the Courtroom. So if you one day find yourself in the proverbial poo, make sure you hire a lawyer and hire one fast. It’s your absolute best bet of keeping your record clean. 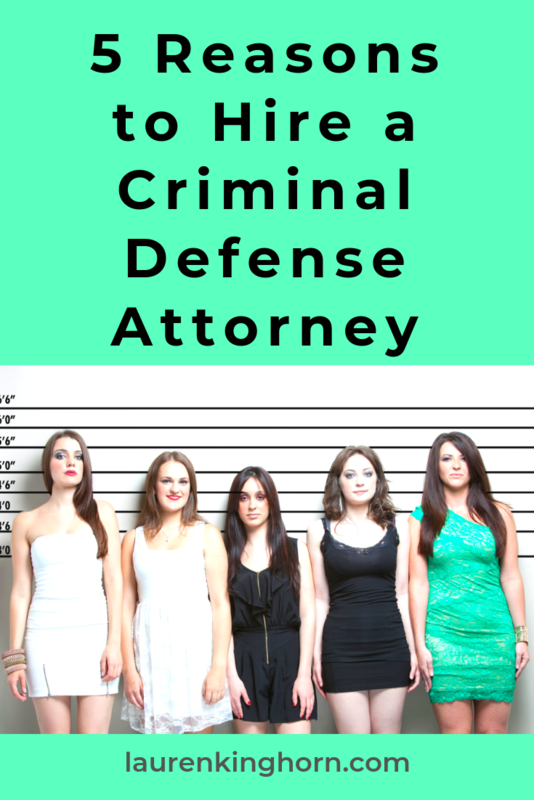 Have you ever had cause to hire a Criminal Defense Attorney? What was the outcome?